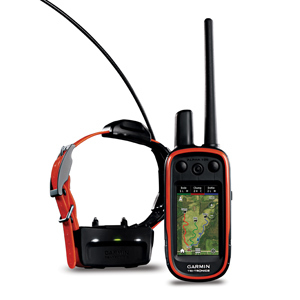 To help you achieve optimum performance from your sporting dogs, Alpha combines proven Garmin GPS dog tracking technology with Tri-Tronics® electronic dog training. This easy-to-use integrated handheld system allows you to track and train your dogs in the field from a range of up to 9 mi, delivering their exact position as often as every 2.5 seconds. 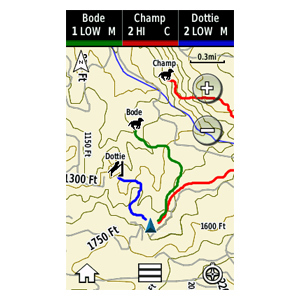 With Alpha 100 and TT™ 10, you can pinpoint up to 20 dogs or hunters’ exact positions on a large, glove-friendly touchscreen display even when they are out of sight. Since Alpha 100 comes preloaded with 100K U.S. TOPO maps you’ll always know your surroundings. Using the Alpha 100, you can measure each dog’s speed, distance and the direction being traveled. 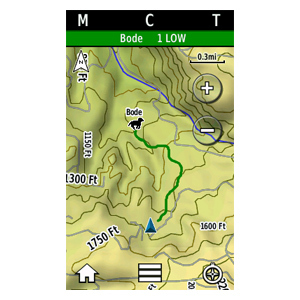 Plus, you can receive notifications when a dog is “Treed” or “On Point.” A single Alpha 100 can track up to 20 dogs or fellow hunters when using either additional Alpha 100 handhelds or TT 10 devices (each sold separately, not compatible with Astro®). Upgrade your view with a BirdsEye TOPO maps subscription for a better-than-real-life view of terrain, including roads, water, woods and more. Alpha 100 helps you train and control them to stop chasing unwanted game or “recall” to your position. Easy to access training buttons allow you to communicate separately to each dog through safe and effective features, including 18 levels of momentary and 18 levels of continuous stimulation or an audible tone command. Plus, a lockout setting is available to avoid accidental stimulation or tone. When using the TT 10, hunters can switch to Rescue Mode to prolong the battery life. When the TT 10 reaches a certain battery level, it will slow down the update rate at which it pings the Alpha 100 from every 2.5 seconds to every 2 minutes. This mode should provide additional battery life to the TT 10, giving you more time to search for and locate your dog.